HomeCould phages pre-programed for a “surgical strike” against antibiotic resistant bacteria be the ultimate microbiome-sparing surface disinfectant or skin sanitiser? A study published recently in PNAS suggests that this could be feasible. The approach is based on ‘clustered regularly interspaced short palindromic repeats’ (CRISPR) and CRISPR-associated (Cas) proteins, which are en vogue for all sorts of applications in medicine. CRISPR-Cas systems are used by prokaryotes to target incoming foreign DNA (an ‘air defence missile’, if you will). It latches onto and then destroys foreign incoming DNA. CRISPR-Cas has been ‘repurposed’ in all sorts of areas of medicine to selectively destroy cells with specific target sequences (a ‘surgical strike’, if you will). The challenge faced on surfaces (of patients’ skin and inanimate surfaces) is different. Here, the bacteria are waiting around to cause trouble, so it would be advantageous to turn a mixed population of antibiotic-resistant and -susceptible bacteria into a purely antibiotic-susceptible population. In this case, any subsequent infection would be the antibiotic-susceptible – and therefore easier to treat – variety. A ‘temperate phage’ (which does not kill bacteria but is co-replicated with it) to knock out a specific antibiotic resistance mechanism (they chose plasmids encoding a carbapenemase (NDM) and an ESBL (CTXM-15) for the purposes of these experiments, but it could be any plasmid). A ‘lytic phage’ (which infects and kills bacteria). This ‘killer phage’ was ‘tagged’ with the same sequences used to target the CRISPR-Cas system to the antibiotic resistance plasmid so that it was seen as ‘incoming’ foreign DNA and destroyed by the CRISPR-Cas defence system. This means that even if an antibiotic-resistant cell missed out on being infected with the temperate phage, it would be targeted by the lytic phage and therefore killed. In the first set of experiments, the authors demonstrate that a carbapenemase (NDM) and ESBL (CTXM-15) -producing plasmid can be selectively eliminated in E. coli by a CRISPR-Cas ‘surgical strike’. The authors also demonstrated that horizontal transfer of these plasmids is blocked. The next set of experiments showed that these newly antibiotic-susceptible E. coli cells are also resistant to infection with the lytic phage, which killed E. coli that did not have the antibiotic resistance plasmids (and so were not targeted by the CRISPR-Cas lytic phage). 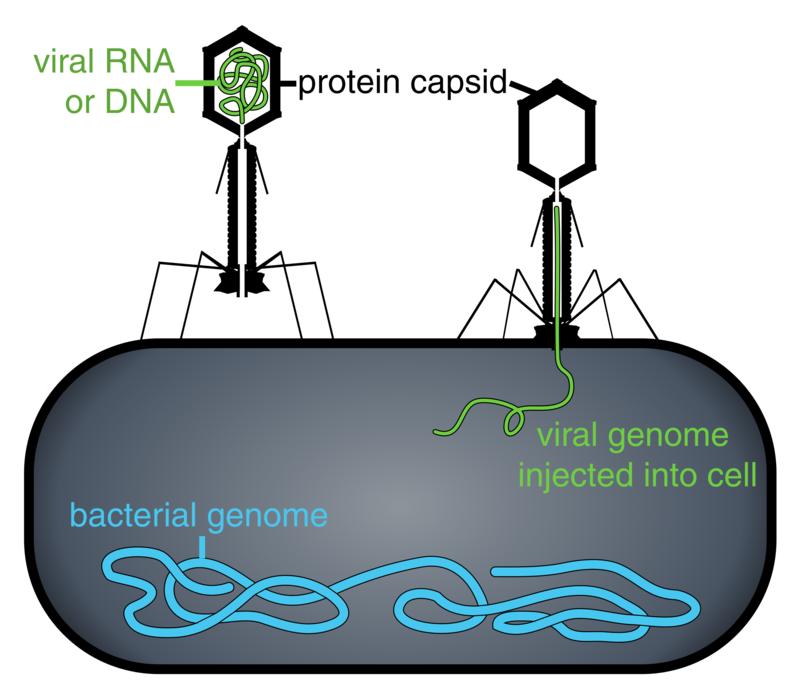 The final set of experiments showed that bacteria infected with the CRISPR-Cas phage outcompeted those without it in the presence of the lytic phage. ‘Phage sprays’ for hospital surfaces are not a new idea – in fact, there are a few FDA-approved phage sprays for food contact surfaces. However, none of these specifically target antibiotic-resistant bacteria, so the approach outlined in this study would be a significant advance. I wonder whether this approach may also offer an interesting approach for decolonising the gut of resistant Gram-negative bacteria? However, one of the problems with this approach is that it only targets plasmid DNA in its current form. It could be modified to target chromosomal resistance genes either directly targeting the DNA or by targeting the transcribed RNA. However, it would need further experiments to demonstrate that this would be successful. This is still at the proof of concept stage, and we are still some way to applying this approach to hospital surfaces or patients’ skin (or colons). But, assuming it does make it to the front line, my major concern is reliance on two separate phages to firstly deliver the CRISPR-Cas system and secondly kill the bacteria that are not infected with the CRISPR-Cas system. This gives the bacterial population two opportunities to develop resistance, and as we know all too well from our experience with antibiotics, you don’t need to ask them twice for resistance to develop! We will then enter a cat and mouse game of tinkering with the phages to make them bypass whatever resistance mechanisms the bacteria develop. But it would be naive to think that bacteria will not ultimately prevail against this approach, as they are doing against antibiotics. That said, I am keen on this principle – and I think it’s a much better approach than seeding the hospital environment with Bacillus sp. spores. ← Can a wound dressing colour change indicate infection?